[Updated 9 April] "No one will enjoy the F1 in Bahrain with cries for freedom from the inside and outside of the race," a protester in Manama told Associated Press today, as activists turned up the pressure on the Grand Prix, due to take place on April 22nd, to be called off. 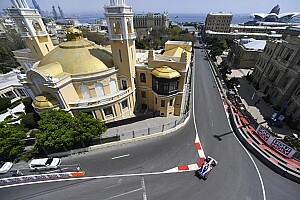 Protests have started to focus on the race itself with anti-F1 slogans and imagery graffitied on walls. On April 8th, according to the Financial Times, a group of youth activists called 'February 14th Youth Coalition', said "it would not be able to “ensure the safety" of Formula 1 participants amid popular anger that would be triggered by the race going ahead." Meanwhile in the UK, former BRDC president and F1 world champion Damon Hill has retracted comments he made over Christmas about the race being a force for reunification of the country. Today, speaking to the UK national press, he has suggested that the race could cause more problems than it seeks to solve. "It would be a bad state of affairs, and bad for Formula One, to be seen to be enforcing martial law in order to hold the race," said Hill. "That is not what this sport should be about. Looking at it today you'd have to say that [the race] could be creating more problems than it's solving." "It's got political and I fear it won't happen now, it's really sad," is the latest message from a contact of this website who is based over there. According to AP, an activist called Abdulhadi al-Khawaja, who is in prison following his part in last year's uprising, has been on hunger strike for more than 50 days. This situation provides a very uncomfortable backdrop for F1 teams to be arriving in the country and doing press conferences where drivers will be challenged for their views on the man's plight and on what they are doing there. Meanwhile prominent British diplomats quoted in the local press in the region, say that the race should take place and lay the blame for dissent at the door of the media, for "always looking for the negative." The UK Foreign Office however, says that there are no travel restrictions to the country, travellers are advised to "avoid crowds" and gives details of eight planned protests taking place over a three day period. "We also expect other protests and disruption in various areas of Bahrain to continue through the coming days. As a result, we continue to advise British nationals in Bahrain to maintain a high level of security awareness and to exercise caution, particularly in public places and on the roads, and to avoid large crowds," reads the travel advisory on the Foreign Office website. And Bahrain International Circuit chief Zayed Alzayani went on BBC Radio 4 to restate the case for the race to take place, "It is very sad what has happened; but we cannot go back and change history, we have to learn from it and move on," he told BBC Radio 4. "I think the grand prix is required for Bahrain because we need to get started back on track. The country has suffered, the economy has suffered."